Stop flipping through a social feed and really read. On this day last January, as part of my #SOLS goals, I wrote about a challenge that I had set myself to complete during 2017: to read 12 books in the year. In January 2018’s first post, I discussed my failed writing challenge and mentioned I would return to the subject of books. Of my 2017 aims, the reading objective was much more successful. Towards the end of 2016, I realised that I was not spending enough time reading: it was too easy to flip open my phone and aimlessly scroll through a social media feed. I have a lot of books that I would like to read, but I would go for months without starting one and, when I did, I would only skim pages. People I admired are often quoted as saying how important books were to them and their careers. In my post, I quoted Bill Gates and linked to a list by Barack Obama. Equally useful would have been reading lists from Elon Musk, Steve Jobs and Jeff Bezos. The signs all suggested I should read more. At work, sometime in late 2016, each member of our team committed to a personal goal, and I decided mine would be to stop flipping through a social feed on my phone while I sat on the train to and from work. I was going to read a book and, what’s more, I decided that they would be old-fashioned, bookshop-bought, books. As January came around, I decided my reading objectives ought to be public, and so I joined the Goodreads challenge. Of the 14 books I completed, I found Elon Musk’s biography inspirational and Jony Ive’s story was remarkable, showing how vital your passions are in life. David Ogilvy’s experience, told through The King of Madison Avenue, was a fascinating blast from the advertising past. 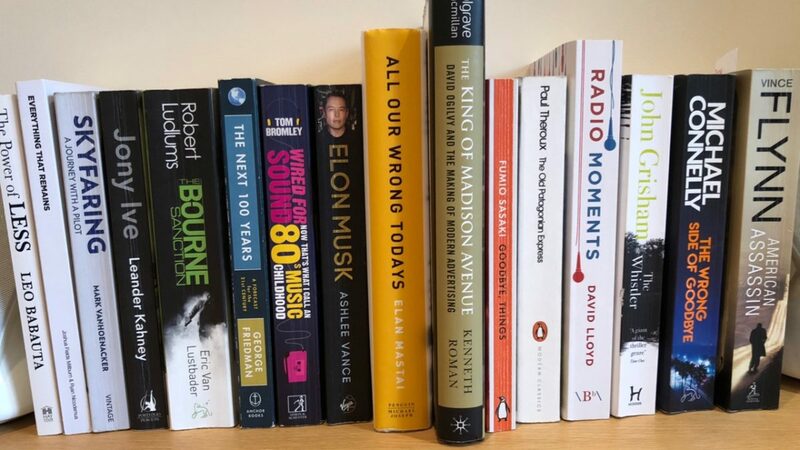 I read David Lloyd’s Radio Moments book – a marvellous insight into life in the British radio industry from the 1970s to the present day – in one sitting on a flight I was taking for work. That one brought back a lot of memories. It took considerably longer to get through Paul Theroux’s The Old Patagonian Express which I found a hard to plough through even though the voyage across the South American continent sounded fascinating. My favourite books were both surprises. The Next 100 Years: A Forecast for the 21st Century by George Friedman was an imaginative look into the future and what the world will be like in one hundred years. Although I will never know how much of it comes true, it’s fun to imagine and more accessible to comprehend when there are the theories George brings to support his predictions. The other big surprise was also a story of the future – and the past – in Elan Mastai’s novel All Our Wrong Todays. I ended the year with perhaps the least challenging of all the books I read across the 12 months. A trio of crime/action fiction novels – from Grisham, Connelly and Flynn – was a lovely easy read to end the year: all three were gripping in a way only master story-tellers like these can do. What was most unexpected was that I discovered that I was enjoying reading and, even more, the act of turning pages in a book was especially satisfying. At the end of the day, I was arriving home more relaxed, and I believe much of that was to do with the ability to focus on something other than work. My boss encouraged all of his team to commit to something through the year, and I’m happy I chose a book challenge because it reminded me how much I enjoy – and can learn from – something more in-depth than a 160 character social post. My Goodreads Reading Challenge 2017 can be found here. I have publicly committed to reading a few more books in 2018, so you might want to follow my progress. The #SOLS challenge failed in 2017 so I am trying again in 2018. It’s the last Sunday of January 2018 and I have a decision to make. Shall I continue with the #SOLS project? #SOLS (Sermon of the Last Sunday) was a self-inflicted challenge to see if I could write on this website at least once a month and make the hosting costs somewhat worth paying. It almost worked. January started off strong with a note about the reading challenge (more on that in another post). In February, I used the #SOLS challenge to post an entry about my amazing trip to Japan. I failed to make the last Sunday in March and the post about Google dominating UK digital advertising was written at the start of April. There was no post at the end of April, nor in May, but the fascinating diary exhibition formed the basis of June’s “Dear Digital Diary“. Major rail engineering works outside London Waterloo station and a shake-up of the train service in South West London formed a trilogy of #SOLS in July, August and September. As we moved into winter time, I wrote about adjusting the clocks in October and a great visit to the top of London’s BT Tower for the nighttime view finished November. Somehow, I missed writing anything in December which means I failed in my goal of writing something every month. Even though I failed the specific challenge, I actually wrote more here in 2017 than I have done for a while. I’m enjoying the experience of trying to be creative at least once a month and so, for 2018, I have decided to try again. I want to go for a full house: an entry every month this year. Stick with me.